The Outdoor Research Expedition Crocodiles Gaiters are large enough to wrap around plastic mountaineering boots and thick, insulated pants, and the Gore-Tex and Cordura fabrics provide waterproof protection. Outdoor Research made these mountaineering gaiters with three-layer Gore-Tex on the upper leg sections and durable Cordura on the inner leg and boot section, so your pants, socks, and legs stay dry on ice climbing ascents. Plus, your crampons won't snag on the insides of these gaiters. Attach the hook on the Expedition Crocodiles to your boot laces, tighten the top cinch-strap, and fasten the urethane-coated nylon instep strap. 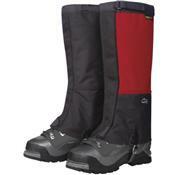 A hook-and-loop tab at the bottom keeps the front of these gaiters closed.